In this eight archive story by Kristian Bertel, the photographer has taken a close up portrait of a woman wearing a sari in India. Picturing an Indian woman wearing a sari in Pushkar, India. In this town, it is said that Brahma once dropped a lotus flower on the earth, so says the epics, and Pushkar floated to the surface. The pond-sized Hindu pilgrimage town is a magical desert-edged place, with one of the world's few Brahma temples. Like the rows of sacred ghats front mystically magnetic lake in Pushkar, where hundreds of milky-colored temples and weather-touched domes sit beneath a shifting, pale grey sky, the sarees are a colorful garment dresses every traveler in Rajasthan and many more places in India see. They are of great interest for the photographer as a photographic subject. With its many styles and colors it is a traditional piece of clothing in India. 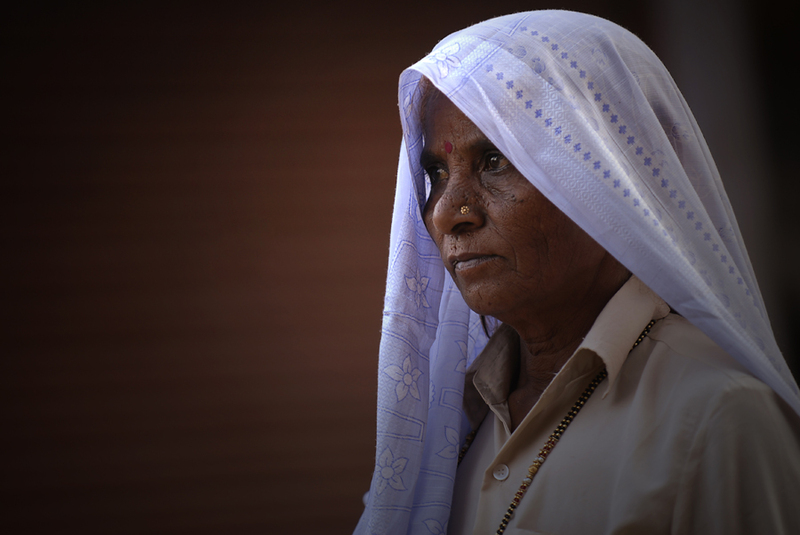 The woman you see in this story is wearing a sari in Jaipur. A sari is a long piece of fabric wound around the body and salwar kameez are worn by women all over India. A bindi is part of a woman's make-up. Despite common belief, the bindi on the forehead does not signify marital status, however, the Sindoor does. There is also another kind of tradional clothing for women in India, which is the rangoli or the kolam, which are a traditional art very popular among Indian women. The word sari is actually meaning 'strip of cloth' and have been of great interest fro the photographer to photograph. 'Sattika' is mentioned as describing women's attire in ancient India in Buddhist Jain literature called Jatakas. This could be equivalent to modern day 'Sari'. In the history of Indian clothing the sari is traced back to the Indus Valley Civilization, which flourished during 28001800 BC around the western part of the Indian subcontinent. The earliest known depiction of the sari in the Indian subcontinent is the statue of an Indus Valley priest wearing a drape. It is generally accepted that wrapped sari-like garments for lower body and sometimes shawls or scarf like garment called 'Uttariya' for upper body, have been worn by Indian women for a long time, and that they have been worn in their current form for hundreds of years. In ancient couture the lower garment was called 'Nivi' or 'Nivi bandha', while the upper body was mostly left bare. The works of Kalidasa mentions 'Kurpasika' a form of tight fitting breast band that simply covered the breasts. It was also sometimes referred to as 'Uttarasanga' or 'Stanapatta'. The tightly fitted, short blouse worn under a sari is a choli. Choli evolved as a form of clothing in the 10th century AD, and the first cholis were only front covering, the back was always bare but covered with end of saris pallu. This type are still common in the state of Rajasthan. India is a land full of stories. On every street, on every corner and in the many places in India, life is rushing by you as a photographer with millions of stories to be told. In the archive story above, you hopefully had a readable insight in the story that was behind the photo of a woman wearing a sari in India. On this website of Kristian Bertel | Photography you can find numerous travel pictures from the photographer. Stories and moments that tell the travel stories of how the photographer captured the specific scene that you see in the picture. The photographer's images have a story behind them, images that all are taken from around India throughout his photo journeys. The archive stories delve into Kristian's personal archive to reveal never-before-seen, including portraits and landscapes beautifully produced snapshots from various travel assignments. The archive is so-far organized into photo stories, this one included, each brought to life by narrative text and full-color photos. Together, these fascinating stories tell a story about the life in India. India, the motherland to many people around the world, a land of unforgetable travel moments. The archive takes viewers on a spectacular visual journey through some of the most stunning photographs to be found in the photographer's archive collection. The photographer culled the images to reflect the many variations on the universal theme of beauty and everyday life in India. By adding these back stories the photographer's work might immensely enhanced the understanding of the photographs.